Learn about enhancements to inline download and the Overview tab rolling out globally. 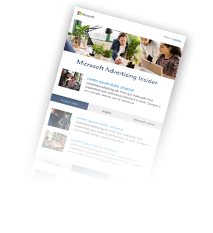 With Bing Ads no longer supporting the ability to edit or create destination URLs at the keyword level starting October 31st, 2018, learn how to take action. With Google Chrome marking all HTTP pages as “Not secure,” Bing Ads encourages updating your URLs to HTTPS.